Ports are instrumental to the international supply chain. Although most supply chains connect through ports, many logistics professionals only have a high-level understanding of the operations of ports and how they achieve the low dwell times and fluidity that their customers rely on. Central to Montreal’s busy transportation industry, the Port of Montreal will provide the context for this in-depth discussion. You’ll learn their strategies for dealing with overcapacity, congestion, partnerships with other modes, and more. If you are unfamiliar with ports, you’ll find fresh insight into the operations and strategies of this vital component of the supply chain. And delegates who do work closely with ports will learn specifics of the Port of Montreal’s business to make better-informed decisions. 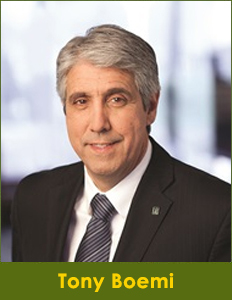 Tony Boemi joined the Montreal Port Authority (MPA) as Vice-President, Growth and Development in May of 2008. Prior to joining the MPA, his entry into the Maritime industry dates back to 1975, when he first joined Canadian Pacific Ships (CP Ships). Throughout his tenure with CP Ships, he held several senior management positions within the company’s different brands, and gained extensive experience in the areas of IT, sales management, marketing, and commercial trade services. His current responsibilities with the MPA include developing the commercial strategies in the sectors of containers, general cargo, liquid and dry bulk commodities and the cruise sector, and also oversees the Port of Montreal’s representatives, based in the USA, Europe, and Asia. He is a board member of the Chamber of Marine Commerce, and is also President of the St. Lawrence Cruise Association.